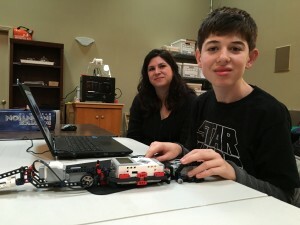 On January 9, 2016 at Autistry Studios, we met Michael, a friendly young man, who was working on a project, building a Lego MindStorm R3ptor, with an Autistry mentor. Michael’s hands were shaky and he was easily frustrated when pieces did not immediately fit together. “I can’t do this. Help me.” This was a common phrase we would hear. Michael needed 5 minute breaks after 10 minutes of working with mentors. Breaks included talking about animals and using a stationary bike to stimulate his senses. By the end of the month, we realized his frustration levels would decrease in quiet, well-lit rooms, so we retreated to the library to continue working on his project. Here we focused on orientation transference from the picture to the object. Many times, the object got turned around when brought close to his body. Each week Michael increased the number of steps he was able to complete on his project over the course of a 4-hour workshop. We saw that frustration levels continued to decrease. As his project gradually but steadily neared completion, we were both excited to see all of the progress he had made. In addition to his actual project, Michael began to physically alter his posture. This allowed him to access his project with greater ease and with greater comfort so that each work session became longer. With our project almost done, it was time to create a poster and prepare a speech because he was scheduled to present and speak at the annual Autistry Maker Banquet on March 19, 2016. Michael chose his favorite pictures, cut them out using a straight edge cutter, framed them, and independently prepared his own speech! We videotaped him, allowing him the freedom to practice on his own. “I feel good about presenting”, he said. 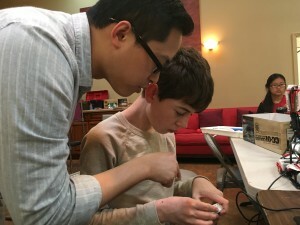 On the night of the Maker Banquet, he looked around the crowded room and said “There are too many people”, so we used calming techniques and positive reinforcement, including practicing his speech. 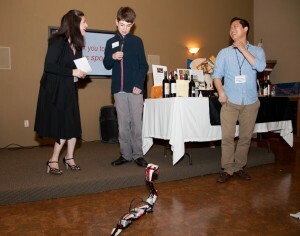 As a result, Michael was able to get up on stage in front of a large group of guests to demonstrate and describe all of his hard work on his project over the past three months. Looking back these last 6 months, we were fortunate enough to spend time with Michael at Autistry Studios and it is difficult to truly fathom the amount of progress he’s made in such a short period of time. From an ergonomically biomechanical standpoint, his improvements in posture, with relevance to both sitting and standing activities, can be generalized to many different settings while engaged in meaningful activities. Earlier on during our working sessions, Michael constantly needed reminders to carry the boxes of Legos closer and perpendicular to his chest, as opposed to either further out in front of him or angled diagonally upward. These reminders became fewer and fewer as he gradually took to observing proper body mechanics with greater independence. Additionally, he began moving his chair closer to the table to allow for improved postural control. This proved incredibly helpful especially when working with and manipulating some of the smaller, more precise Lego pieces. Finally, he began using his legs more often when lifting heavier objects from the ground as opposed to using the muscles in his lower back. 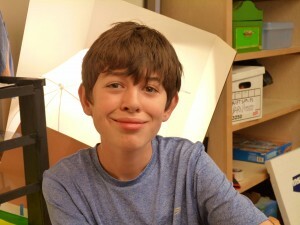 Selecting and working diligently on preferred activities at Autistry Studios has allowed Michael to not only make gains from a biomechanical perspective, but also from psychosocial and behavioral standpoints as well. As mentioned previously, we observed marked decreases in levels of frustration while working on his projects over a timespan of just a few months. Regulating himself appropriately while observing social rules of conduct during lunchtime was a strength of Michael’s, but being able to endure through times of difficulty and push onward while working on his projects was a remarkable feat to witness, especially when noting low baseline levels of activity tolerance when we first met him. The duration and frequency of rest breaks while working on his project has decreased, indicating greater patience and ability to persevere through challenging obstacles. Michael has also demonstrated increased flexibility when receiving denied requests or when working with changes in routine. 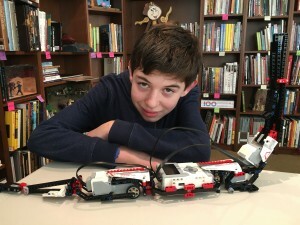 For example, when we discovered that his R3ptor projects was missing a piece, he was able to skip the step, work ahead, and patiently wait for staff to purchase the missing relevant Lego piece. Finally, daily conversational skills have also improved. Michael is better able to remain on topic and participate in social reciprocity with peers or staff during conversations while maintaining appropriate distance between himself and others. This entry was posted by Erin Chaffee on Monday, August 15th, 2016 at 12:07 pm	and is filed under Uncategorized. You can follow any responses to this entry through the RSS 2.0 feed. Both comments and pings are currently closed. Erin Chaffee has a BS in Kinesiology from Sonoma State University and is currently pursuing a Master's Degree in Occupational Therapy at Dominican University. She brings a wealth of knowledge, experience, and heart to Autistry.